Welcome to the Airblast Eurospray Blast Pot Buyer’s Guide. Unfortunately, there is no set formula for the type of blast pot required for an application because every situation is different. However, this guide will give you an idea of what you need to be thinking about when choosing a blast pot and can help you decide which is most likely to suit your requirements. What are you going to be blasting? The first thing to consider is what the blast pot will be used for. Blasting is used in so many applications, it would be impossible for us to list them all here but there are a number of factors applying to all blasting work which will affect the type of pot you need. For big projects, you will most likely require a large capacity blast pot (e.g. 150 or 200ltr). This will mean that you can blast continuously for longer without refilling. For smaller projects and occasional work a smaller capacity pot like a 50 or 100ltr will be sufficient and will offer more manoeuvrability than the larger models. If you are planning to use the pot for site work, the smaller, more manoeuvrable pots will most likely serve you better than the larger pots, which are better suited to in-house work. 60 psi – Useful for cleaning soft wood and lightly soiled stone and etching some metals. 80 psi – Useful for cleaning heavily soiled stone and etching steelwork. 100 psi – Useful for millscaled or rusted steel and iron. Airblast Eurospray’s premium range of pots has a maximum working pressure of 7.5 bar while our Redline range can go up to 12 bar. Both ranges can be fitted with a regulator if required to regulate air from the pot down from 100 psi to as low as 40 psi. To achieve the right level of psi, you will need to choose the right size of compressor and combine it with the optimum nozzle for that size. The chart below should give you an idea of what size compressor you will require to achieve various pressures depending on the size of nozzle. How long do you want to be able to blast at a time? 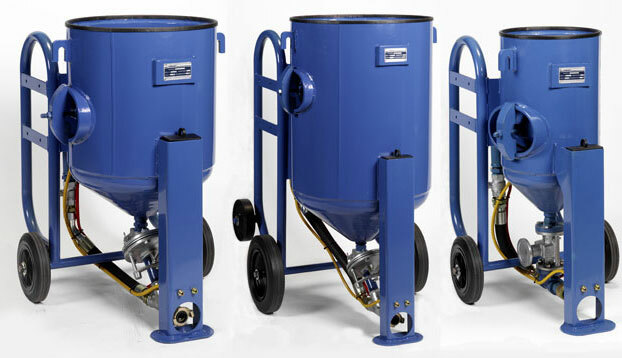 Different sized pots offer longer durations of continuous blasting. However, longer blasting durations are usually reflected in the size of the pot, so you may need to sacrifice blasting duration for manoeuvrability. It is important that if you are planning to work offshore or in other high risk environments, that you choose a pot that meets the required safety standards. Airblast Eurospray’s Redline Contractor Pots are ideal for some of these applications as they can be ATEX approved. Where are you going to be blasting? The next step is to think about where you will be blasting. Whether you’re working outside, in-house, offshore or on restricted sites, there are a number of key factors that will determine the type of blast pot needed for different applications. You need to consider whether you need a portable blast pot or whether a stationary one will be suitable. Stationary units are generally big and can offer you a longer period of continuous blasting before they need to be refilled but they are also cumbersome and not as easy to move around a site. The smaller more portable units are much better suited to site work. The Redline range of pots are specifically designed for contractors and are ideal for this type of application. Do you need the pot to fit through a standard door? If you are going to be working inside houses with standard size doorways, then you should bear in mind that only our AB1028 and AB1440 models are slim enough to fit through these. What sort of site access do you have? If you’re often required to work on particularly rough or rocky ground, then the Redline contractor range can provide a more robust blasting solution as it features large rugged wheels for manoeuvrability. Both the Redline and Airblast Premium ranges feature lifting eyes for added mobility. What sort of transport do you have? If you’re going to be using your blast pot for site work, it’s very important to consider how you’re going to transport it. Our smaller blast pots, the Airblast AB1028 and AB1440 and the Redline 100ltr, will fit in small vans and can be loaded by a two-man team. The Airblast AB2040 and AB2452 and the Redline 200ltr models will require a larger vehicle to transport them. They are also heavier and will usually need to be loaded using a tail lift or a three-man team. Do you need a full package blast pot or do you already have some parts? Airblast Eurospray offer a range of blast pot packages which can include as much or as little as you need. You can either buy the blast pot with just a water separator, or you can buy various packages which include blast hoses, couplings, nozzle holders, deadman lines, deadman handles, breathing filters, breathing lines, blast gloves and blast helmets. Airblast Eurospray offer a range of six blast pots. We have four pots in our premium range and two in our contractor range. Airblast’s premium blast pots are manufactured here in the UK and are built to last combining high standards of manufacture and component quality with an ergonomic design. Our premium blast machines are fitted with high end grit and remote control valves and are more hardwearing requiring less maintenance. The grit valves are tungsten carbide lined and are able to stop media flow whilst maintaining air. This feature, controlled from the dead mans handle, provides the operator with a powerful blow down gun for cleaning down jobs after blasting. Additional options on this unit include a 12 bar option and electrical controls for longer blast hose runs. The unit can also be built in “pressure hold” mode. Pressure hold mode allows the blast machine to be deactivated without depressurisation. This feature enhances production and avoids wear to the grit valve caused when a machine is depressurised and pressurised frequently. Airblast 1028 - The smallest and most manoeuvrable of our blast pots, this pot has a 20 litre capacity. Airblast 1440 - A mid-sized pot with a capacity of 60 litres. This pot is still fairly manoeuvrable. Airblast 2040 - This pot holds up to 110 litres, but is more suitable as a stationary pot due to its size and weight. Airblast 2452 - This is the largest pot in Airblast’s premium range with a capacity of 200 litres. It is only suitable for stationary applications in most circumstances. Our contractor pots are specifically designed for site work and feature large rugged wheels and lifting eyes. Redline Contractor (100ltr) - This is the smaller of our two contractor pots with a capacity of 100 litres. Redline Contractor (200ltr) - The larger of our contractor pots holds up to 200 litres but is still portable, making it great for site work. Below, you’ll find a table with details about the blast pots currently available on AirblastEurosprayDirect.com, including prices (at the time of publication), maximum working pressures and a number of other factors which we have discussed above. This table should serve as a quick reference to help you choose the pot that is right for your requirements. There are a huge number of different media options which can be used in conjunction with our blast pots and there isn’t time to run through them all here. However, you should consider what type of media you will be using with your blast pot. For more information, see our Blasting Media and Abrasives Guide.